All the tools are also available in the Spanish language (Español) now. Note: Only ASAP Utilities itself it translated at this moment. The setup is still in English and so is our website. All the items in the menus and on the forms now have mnemonics (also refered to as accelerator keys, access keys, hotkeys or sometimes keyboard shortcuts). A lot of the tools already had these, but we have now added it to all of the tools, in all available languages. Accelerator keys are key combinations consisting of the letter key pressed along with the Alt key. This makes it easier to use ASAP Utilities without a mouse. It can also increase the speed of your work and reduce the chances on RSI. Note: you can (and could) also navigate through the options with tab and shift+tab keys and you can always close a form with the ESC key. Expanded. This utility showed the number of unique values, which were the values that appeared only once in your selection. We have now updated the utility to show both the unique (distinct) values, and the values that appear only once in the list. For example, with the values 1/1/2/1/3 the unique values are now 3 (1, 2 and 3) and the values that appear only once in the list is 2 (2 and 3). Improved speed. Furthermore you can now use all sort options when you have selected both worksheets and chart sheets. Instead of inserting the rows below your selected range the utility now inserts the rows above your selected range. 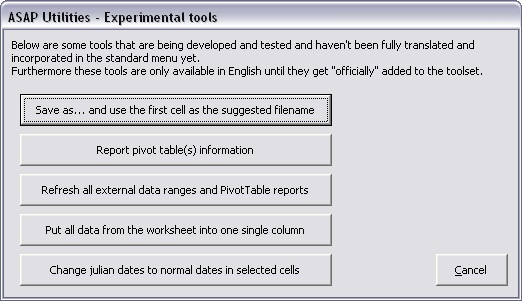 We have changed this to reflect the default behavior of Excel when you choose in the menu Insert > Row. Four worksheet functions are updated for Excel 2007 and later. Before Excel 2007 a workbook could only contain 56 colors. We used the colorindex property of a cell or font for certain functions. 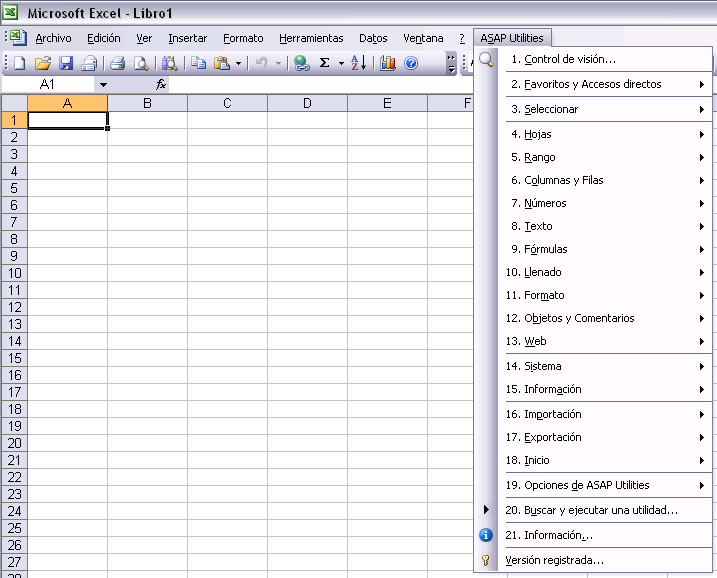 Until Excel 2007 this worked perfect. However, in Excel 2007 and later this isn't always reliable anymore because the colorindex number can be the same for different colors. Therefore we have now updated the functions that are listed below. If you specify a range for the color instead of a colorindex number then the function work as supposed in Excel 2007 and later. For example to sum the cells in range A1:D100 that have the same color as cell A1, you can use the following formula: =ASAPSUMBYCELLCOLOR(A1:D100, A1). The formula will then return the sum of all cells in A1:D100 that have the same fill color as cell A1. If you have used this utility before you have to press the 'reset' button to have these new characters added. The last 20 values you use to insert before or add after will now be remembered. You can either type in a new value or select a previously used value from the list. The screen resolutions 1366 x 768 pixels and 1280x720 were added. The 1366 x 768 pixels display resolution is for example used on certain Sony netbooks. Now you can quickly change Excel to this resolution so that you know how your spreadsheet model will look on such a computer. The resolution 1024 x 600 pixels which is used by most netbooks, such as the ASUS EEE, was already included. New tools that are currently in development. These tools are available in the English language only during this experimental phase. This could produce an error on worksheets with a pivot table and stop this tool from actually working. That is now fixed. Fixed a few small bugs. For example when you had the option to include chart sheets selected in Excel 2007 you could sometimes get the error 'Microsoft Excel cannot paste the data.'. It wasn't a consequent error that happened all the time, but just sometimes it popped up. We have now created a workaround for this and haven't seen the error since. 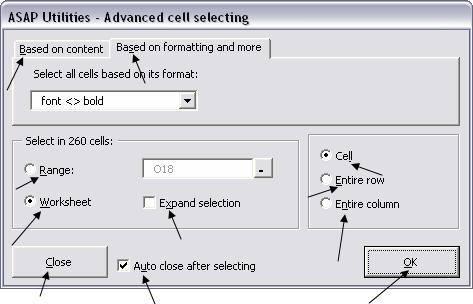 After the utility completed an incorrect range of cells was selected. This is now corrected. This utility removed the ending rows and columns that contain no data. However if you had for example a chart there and its properties were set to 'Move and size with cells', the chart was resized and could become invisible (a width of zero and/or height of zero). This is now fixed by using another method. Fixed the bug that caused certain Lithuanian characters (ąčęėįųū) to their diacritic marks. (A little background information on this: The VBA function StrConv() can be used to change text to uppercase, lowercase or proper case, however, that function caused these specific characters to lose their diacritic marks, for example č becomes c. We now use another method that is also reliable in with these characters). When you used a template sheet that contained cells with more than 255 characters, the excess characters were stripped off on the newly created sheet. That also happens when you manually copy a sheet with more then 255 characters and Excel will then warn you about this. 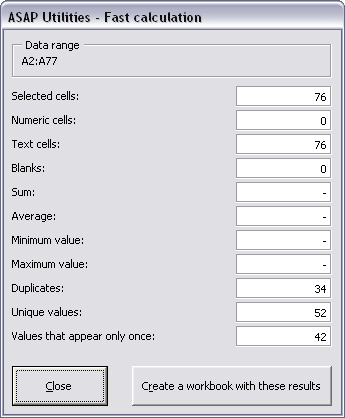 We have now updated the utility so that it also is an exact copy when there are cells with values of more then 255 characters. When you had a text string and the result was a number, then the leading zeros were removed. For example a value such as 00032-2, from which your removed the last 2 characters, resulted in 32 without the leading zeros. Now it returns 00032 in such a case. When you had a text string and the result was a number, then the leading zeros were removed. For example a value such as 12-0064, from which your removed the first 3 characters, resulted in 64 without the leading zeros. Now it returns 0064 in such a case. When you had a text string and the result was a number, then the leading zeros were removed. For example a value such as 00032-2, from which your removed all after the first 5 characters, resulted in 32, without the leading zeros. Now it returns 00032 in such a case. Fixed the bug where in some cases when you chose the option "Copy the values", the result showed the error #REF! instead of the values from the sheets. Fixed the bug where in certain situations it didn't produce any results. This could be the case if there were cells in your worksheet with very long text values. A few small bugfixes and improvements.